Volvo's new Polestar brand has declared war on Tesla with the arrival of its new Polestar 2. The Polestar 2 packs a 78 kWh battery driving two electric motors, which combine to produce 400 horsepower and 487 lb-ft of torque. 0-60 mph takes just five seconds and Polestar claims a driving range of 275 miles on the EPA rating scale. These specs certainly put the Polestar 2 within spitting distance of the Tesla Model 3 but the price may be another story. For the first 12 months of production, the only Polestar 2 available will be the Launch Edition for $63,300. Even the most expensive Tesla Model 3 Performance, which is faster and has a longer range than the Polestar, only costs $60,900. The Polestar's full $7,500 tax rebate may soften the financial blow but according to Autoblog, there may be more financial relief coming for potential buyers. We knew a cheaper version below the Launch Editon would be coming eventually and speaking with Hans Pehrson and Christian Samson from Polestar's R&D division at the 2019 Geneva Motor Show, it was discovered that this cheaper model would cost around 38,000 euros (around $44,000 at current exchange rates). Using exchange rates isn't always a perfect predictor of how much a car will cost in the US but at least we know the Polestar has the potential to be more affordable. 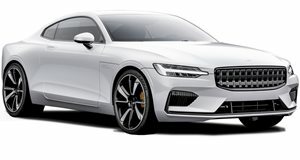 Pehrson and Samson confirmed that the cheaper Polestar 2 would have a smaller battery but would not say what its range will be or whether it would be all-wheel-drive, front-wheel-drive, or rear-wheel-drive. Polestar also announced the launch of a new Polestar Explore app, which will let users use their phone as a car key (like a Tesla Model 3) and even build and purchase the car without having to go into a dealership to haggle on price. The app is currently available to download on Android and iOS devices and customers can now place their preorders for the Polestar 2.